Dimensions 0.75 by 8.25 by 11 in. Indians of North America; Legal status, laws, etc. Trials (Political crimes and offenses); United States. âIf the moral issues raised by the Sioux people in the federal courtroom that cold month of December 1974 spark a recognition among the readers of a common destiny of humanity over and above the rules and regulations, the codes and statutes, and the power of the establishment to enforce its will, then the sacrifice of the Sioux people will not have been in vain.ââVine Deloria Jr. 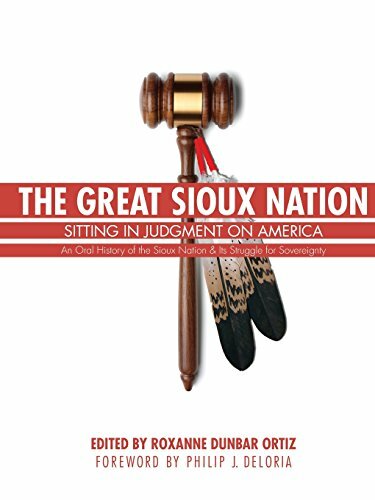 The Great Sioux Nation: Sitting in Judgment on America is the story of the Sioux Nationâs fight to regain its land and sovereignty, highlighting the events of 1973â74, including the protest at Wounded Knee. It features pieces by some of the most prominent scholars and Indian activists of the twentieth century, including Vine Deloria Jr., Simon Ortiz, Dennis Banks, Father Peter J. Powell, Russell Means, Raymond DeMallie, and Henry Crow Dog. It also features primary documents and firsthand accounts of the activistsâ work and of the trial. New to this Bison Books edition is a foreword by Philip J. Deloria and an introduction by Roxanne Dunbar Ortiz. About: “If the moral issues raised by the Sioux people in the federal courtroom that cold month of December 1974 spark a recognition among the readers of a common destiny of humanity over and above the rules and regulations, the codes and statutes, and the power of the establishment to enforce its will, then the sacrifice of the Sioux people will not have been in vain.